We’ll make peacocks, penguins and pizzas as we learn and practice the P sound. Please practice the P sound with your children and challenge them to identify P words. Using our number line we’ll review numbers1-15 (recognition and order) and use peanuts, popcorn and pretzels for sorting and graphing. At circle time each morning we review name cards, days of the week, months of the year, the seasons and the day’s weather! A lesson/activity on positional words will help the children with organizational and placement skills. Please review above/below, in/out, on/off, over/under, between and next to with your children. To encourage phonological awareness, we’ll have lessons on syllables. The children will hear 1, 2, 3, 4 and 5 syllable words and use their hands and connecting cubes to “clap” the syllables. We have fun “clapping” our names (first and last)!! We’ll have fun playing a rhyming version of I Spy that will stretch the childrens’ listening and observation skills. 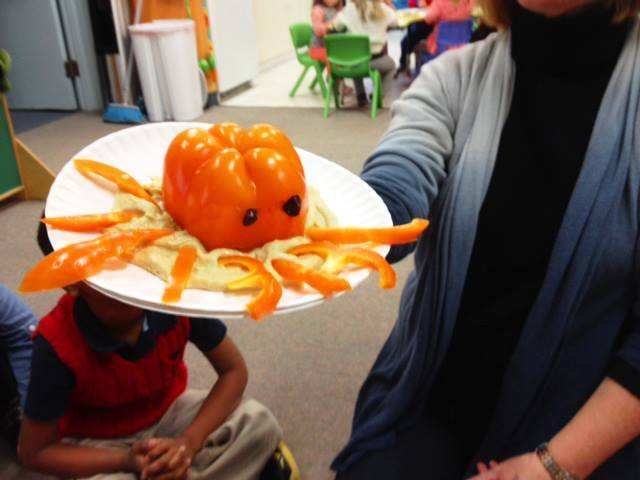 Ask your children about our edible octopus! We had so much fun and skill building ( math and language !) and we loved the peppers and hummus. This week each child will be encouraged to take turns. This week we will create a winter night sky using different shapes and white paint while learning about the letter N. The class will learn and practice writing the letter n while using a paint bag. We will name items that start with the letter N.
The class will review numbers 6-10 by counting and adding items to our cool snowman we plan on creating! We are going to tear pieces of tissue paper and place them on contact paper. Tearing any type of paper will strengthen your child’s fingers and hands, which will prepare them for writing with a pencil. We will name animals that can live in cold climates. We’ll review letters M,N and O, practice our letter formation and continue writing our names with upper and lower case letters. At circle time we’ll talk about winter weather and how we dress to keep ourselves warm! We’ll learn about hibernating animals and how they prepare for and thrive in winter. Science activities will include experiments about solids and liquids (what happens when a variety of items are placed in water) and bouncing ( what items bounce and why!). We’ll use M and M s, peanuts and oranges to learn about graphing. As a treat we’ll make and snack on edible snowmen! This week each child will be encouraged to share whatever they are playing. Retell the story of “The Mitten” in correct order using animals. make a paper plate clock and color in a QUARTER of the clock face. Read a variety of books about snow and winter- discuss clothing worn and why. This week we will have a Phonics Review for the letters J-M by doing picture sorting, writing and initial sound matching. I want to continue reading and exploring The Mitten. I have so many neat crafts and learning manipulatives that relate to The Mitten. Some projects we plan on doing are sorting paper mittens from smallest to largest and matching mittens with the correct number. 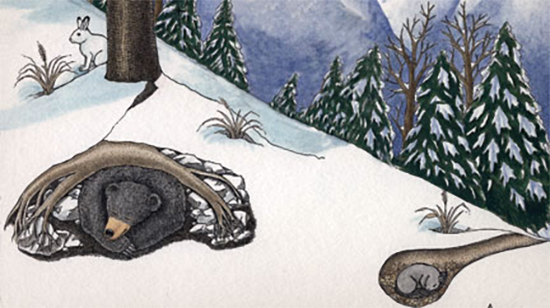 This week we are going to talk about hibernation and read stories about the animals that hibernate in the winter. We will start an early valentines day project to hang on the main bulletin board as well.